Important: Make sure that you’ve removed the compartment cover as well as unplugged the 3-in-1 cable and audio cable from the headset. For details, see Unplugging the 3-in-1 cable and audio cable from the headset. Detach the standard strap and buckle by rotating the buckle downward. You'll hear a click when the buckle is released. 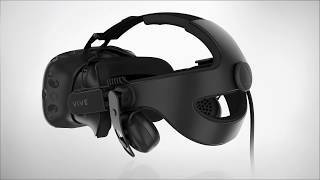 Press the buckles of Vive Deluxe Audio Strap to the connectors on the headset using the palms of your hands until you hear a click to fix them in place. Insert the 3-in-1 cable and the strap’s audio cable into the compartment cover’s cable hole (not into the hole on the VIVE logo). Connect the cables to its corresponding slots in the headset’s compartment. To replace the compartment cover, align the ridge on the cover with the tabs on the compartment, and then push the cover until it snaps in place. Fix the 3-in-1 cable in place on the clip on the right side of the strap. Attach the sticky back of the velcro cable tie (comes with the box) underneath the cushion (right side). Loop the cable tie around the 3-in-1 cable, and then fasten it in place. Insert the strap’s velcro band to the compartment cover’s band lock, and then secure it in place. To remove the Vive Deluxe Audio Strap, pull out each of the strap’s buckles to detach the strap from the headset.